Our fast-paced and stress-filled schedules open the gate to allow people and circumstances every opportunity to “get our goat.” HIDE YOUR GOAT puts into perspective how your daily life intersects with people of diverse backgrounds, opinions and personalities. 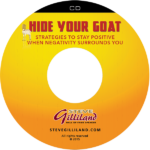 In this eye-opening CD, Steve Gilliland shows how to avoid being robbed of the opportunity to perform at peak performance because of negativity. Move over, Dr. Phil and Dr. Oz! 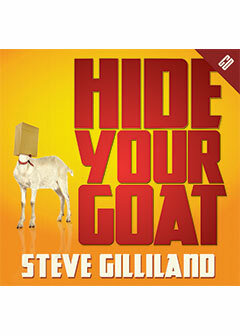 HIDE YOUR GOAT is a self-help book for the ages. This is truly an ingenious and brilliant look at how to rise above all the negativity. Thanks for the gift, Steve! I cannot remember being more entertained while at the same time being touched and left with such a profound message. HIDE YOUR GOAT opens your eyes and makes you take a long look in the mirror. This book can help you deal with the negativity that surrounds you. If you're looking for a way to stay positive, read this book. If you're interested in learning how to deal with negative people, read this book. If you are always letting people get your goat, read this book! Just finished your book HIDE YOUR GOAT. You are brilliant in guiding people in day to day problems. Thanks for giving me new perspective about life. Keep on rocking.